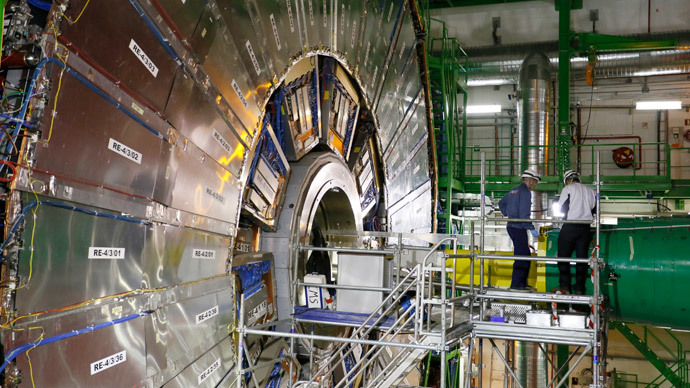 The world’s largest particle smasher, the Large Hadron Collider (LHR), has finally smashed photons together after a two year repair and maintenance program, the European physics lab CERN said. Low energy collisions took place on Tuesday, at an energy of just 450 gigaelectronvolts (GeV) per beam. This will allow the scientists to fine tune the LHR as they raise the power up to 13 teraelectronvolts (TeV) next month. “It’s a nice milestone today. There were a lot of smiling faces in the control room,” Dave Charlton, spokesperson for the LHC’s huge multipurpose Atlas detector, told the Guardian. When the LHC is running at full speed it can capture billions of collisions every second. “From what we’ve seen so far, everything looks good. Having collisions like these means we will be much more ready for high energy collisions when they come,” he said. The experiments at CERN aim to unlock clues as to how the universe came into being by studying particles considered to be the building blocks of all matter and the forces that control them. In 2012, scientists at the LHC proved the existence of Higgs Boson, the so-called God Particle, first theorized by two scientists, Peter Higgs and Francois Englert, back in 1964.They subsequently earned the Nobel prize for physics on its discovery. During the next stage of the LHC program, physicists will be looking at an area known as new physics, which includes anti-matter and dark matter. We are not able to see these, but they are thought to make up most of the Universe. In contrast visible matter only makes up four percent of the universe. Other results may reveal the existence of hidden dimensions through which gravity spreads, explaining why the gravitational pull of the planet is weak enough to overcome just by jumping.